Established as a subsidiary of China State Shipbuilding Corporation (CSSC) in 2017, CMS delivers a range of services for CSSC-manufactured marine engines. In addition it handles warranty work on behalf of engine manufacturers, Hudong Heavy Machinery (HHM) and CCSC MES Diesel (CMD), while in January this year CMS entered into a global service partnership agreement with Winterthur Gas and Diesel (WinGD), covering all low-speed components and after sales activity. Over the past year CMS has been steadily expanding to meet customer demand with regard to parts supply, field services, drydocking, warranty support, maintenance agreements and remote monitoring services. A 24-hour hotline service also commenced at the beginning of 2018, and this is serviced by local service experts with back up support from CMS’ OEM licensors. The launch of CMS by CSSC in June 2017 coincided with the inauguration of a new logistics centre located within the Yangshan free trade zone in Shanghai. This facility acts as the hub for CMS’s global distribution network with the aim of facilitating the timely delivery of key engine components on a global scale. The logistics centre comprises a warehouse and distribution facility in a 9000m2 site, and is able to accommodate a wide range of original engine parts, including fuel injection equipment, piston rings, pipes, flaps and valves, cylinder liners, covers and piston crowns. Staff from the CMD and HHM sales teams are co-located at the Yangshan logistics facility, enabling collaborative working, while the location is in easy reach of port facilities. The company indicates that planning is well underway for the establishment of further service hubs, initially in South Korea, Dubai, Hamburg, Singapore and Greece. Closer cooperation with a partner in Houston is also envisaged, albeit at a more technical level. The fairly ambitious overall target is for CMS to operate a total of six strategic service hubs and 28 service stations worldwide by 2020. Andrew Stump, CMS president, states: "Since the company’s launch in 2017, CMS has rapidly gained traction in the market. We are quickly gaining customer trust and the result is the signing of an increasing number of maintenance and inspection agreements. Therefore, we are putting the key infrastructure in place in order to secure the continued expansion of our services in the marine sector." 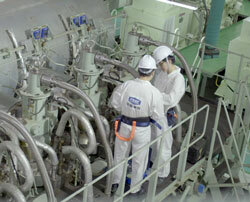 Speaking to Shiprepair & Maintenance at SMM, he added: "I would like to expand more quickly. We have so far taken a conservative approach but now it’s starting to speed up." The idea behind the establishment of CMS, said Stump, is to consolidate the service ethic of the CSSC group into one organisation, replacing the previously fragmented approach to aftersales service support with a more coherent and integrated structure. Eventually the intention is that CMS will service the entire CSSC product portfolio, but the focus for the time being is on main engine services for HHM, CMS and WinGD, and in particular on the low-speed engine segment. Many of the employees at CMS have come from within the CSSC organisation, and while this has benefits, in terms of product awareness, it also presents some challenges. As Stump explained: "At the moment most of our staff have a background in manufacturing. My task is to get them to think in aftersales mode." Being part of a big group is also a mixed blessing, he suggests: "The CSSC name is well known and that is a door opener. But when I mention services they say, ‘that’s new’, so there is a barrier of perception to be overcome." Moving the culture of the organisation from manufacturing to aftersales and service is a key task for Stump, but the group’s shareholders have given him their backing, he said. "In this early start-up phase my employers have been very understanding and supportive. The market requires a change in behaviour and a different perception of a Chinese service organisation. This is an area they want me to look at in the longer term."